With a floor space of 172 sq. mt(1851 sq. ft) you will be spoiled for space in this peaceful retreat which is beautifully appointed - created for those who appreciate privacy and want spacious areas for relaxing, working or playing. We only allow one party in the house at a time so when you book the place it will be all yours for the duration of your stay. This house is great for a large crowd. High Speed Wi-Fi access throughout the property. This property offers two large bedrooms which are separated by a large kitchen and a deck. 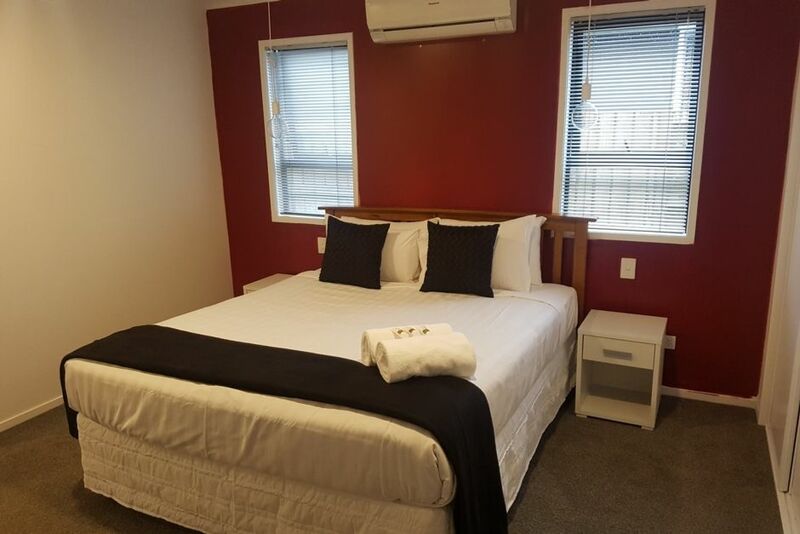 The huge space between the two bedrooms makes this an ideal accommodation for two couples or groups travelling together but appreciate their privacy and quiet time when on the go. This is an en-suite. It is has its own air conditioner/heat pump perfect for those chilly or hot nights. The room has one king size bed (which sleeps two), its own toilet and bathroom and a claw foot bath. The bed is made with linens which are rented from an award winning laundry so you will be sleeping on clean, crisps sheets. There is a 42 inch flat screen 3D Smart TV with Netflix. The room also has a large closet. In the closet are hangers, a hairdryer, an ironing board and an iron. This room is larger in size and is situated near the main walk in bathroom and the second toilet. The room has one queen size bed (sleeps two). This bedroom also has a large closet and the room is large enough to accommodate 2 more guests if required. The front wall of this bedroom is made of a 4 Panel Stacker Double Glazed Glass Slider door and opens to the covered deck. Food is a huge deal when travelling. If you prefer to cook on the go, this house provides you with a “dream kitchen” to cook and entertain and bring everyone together. All pots, pans and crockery are provided. The kitchen has a 4 burner induction cook-top which does not heat the house when it is in use. The Kitchen also has an Oven, a full dishwasher (we provide dishwashing tablet and detergent as well) and a full Fridge/Freezer. Along with the hot water jug and the toaster, in the pantry you will find a rice cooker, a fast and slow cooker, a deep fryer, a coffee machine, coffee plungers, tea pot, electric frying pan, bread maker, tea, coffee, salt and sugar. If you wish to dine on the covered deck, a large sliding window in the kitchen opens to the deck which makes serving food a breeze. The dining area has a square dining table which sits 8, so the whole crowd can dine together. The lounge has appealing high ceilings. It comes with a 3 seater and a 2 seater sofa. We also provide two bean bags for extra sitting. A 55 inch flat screen 3D Smart TV (with YouTube, Prime Video and Netflix) is fixed on the wall which can be viewed from the outside deck and the kitchen as well. The wall of the lounge is also made of a 4 Panel Glass Stacker Slider Door which opens to the covered deck with the in and out flow. Probably the most attractive part of the house, the deck has high ceilings and walls on 3 sides and as has been mentioned several times, it is also conveniently covered. This makes the deck usable regardless of the weather. We provide an outdoor gas heater for those chilly nights – with a bottle of gas. The deck is furnished with a large coffee table and a 2 seater sofa and two single chairs. You will find the BBQ grill on the deck as well. The internal access single secured garage comes with plenty of storage for your bike and other gears in a secured garage. Get your laundry done in the large laundry which comes with a front loading washing machine and a dryer. This house is about 3.5 years old and is located in a nice and quiet neighbourhood. The main city centre is about 5 minutes’ drive away or a 15-20 min walk. We are well located almost within 20 minutes of drive from all major tourists’ attractions. You can safely store all your sporting gear and your car in a secured single internal access garage. No noise after 10 pm please. Originally from Canada, I came to New Zealand in 2007 to study law and have lived here ever since. I am an avid traveller myself and when I travel I love staying at Homes instead of hotels as I find that much more relaxing. Now, I am in a position to provide traveller who come to Rotorua with the same privilege hence my reason for becoming a host. My home is designed to provide a warm and relaxing environment for travellers and I will do whatever it takes to make your stay as comfortable as possible. This property is only 3 and 1/2 years old. It is more like a two bedroom apartment with a full kitchen, living room and a large covered deck. We also have a full laundry which has a front load washing machine and a clothes dryer too. This is a great substitute to staying in a place like Quest. The house is a about 5 minutes drive away from the city and the lake front. Kuirai Park (which is home for the city's Saturday market) is 3 mins drive away, Rotorua Hospital is 4 mins drive away, Skyline is 6 mins drive away and the Redwoods Forest and cycle way is about 10 mins drive away. This is a service apartment type of accomodation except that we don't have daily house keeping and staff on site. Unlike a serviced apartment though, with a floor space of 172 square meters, this bungalow provides you ample space to work, play and relax. It comes with a full size kitchen which is equiped with a 4 burner inducion cook top, 32 litre microwave oven, 551 litre fridge/freezer, a full size diswasher, all pots and pans, skillet, wok, deep fryer, slow and fast cooker, rice cooker, breadmaker, coffee maker, all cooking utensils, dinner sets, wine glasses, tea, coffee and sugar. The bungalow has a large laundry which is equiped with a front load washing machine and a dryer. Very pleasant patio, roofed, and surrounded on three sides by the house, so it is shady, quiet and peaceful. We provide access to unlimited fibre internet. Netflix, Prime Video and access to Curiosity Channel as well. we have 2 smart 3d tvs in the house and one 3D blue ray player. Available in the living area and also in the en-suite. Included as part of the package. Our linens are professionally washed and ironed and rented from an award winning laundry so you will be sleeping on clean, crisps and luxurious sheets. Included as part of the package. Water extracted from the damp clothes are collected in a tank which is attached to the left top corner of the dryer. Always ensure this tank is empty and clean the lint drawer before starting a cycle. The Bungalow comes with an internal access locked garage. Internal access locked garage which is perfect for storing all your sports gears. High speed super fast fibre unlimited internet available. We also have subscribtions to primevideo and netflix. A 55 inch Smart 3D Television is provided in the lounge with one 3 seater lunge suite and one two seater. Two bean bags are also available. A large 2 door Fridge/Fridger is available. We have an induction cooktop. A switch on the right side of the hob will activate the hob. Pots and pans are provided. Coffee maker is provided and will be in the large pantry, on the right of the fridge. We provide hot water jug, a toaster, coffee maker, chopping boards, large bowls, rice cooker, slow/fast cooker, deep fryer, electric frying pan, breadmaker, tea, coffee, sugar and salt. All pots and pans and corkery are provided. The seperate dining area is equipped with a large 1.5 m by 1.5 dining table, which sits 8. The whole family can dine together. High chair can be provided upon request. The en-suite has a 42 inch smart 3D tv. The living area has a 55 inch Sony smart television which also has 3D capablities. The Bungalow is surrounded by lawn which is clipped as frequently as possible. Large deck which is surrounded by 3 walls of the house and is covered. We provide an outdoor gas heater, with a tank of gas, which means you can enjoy the deck even in cold weather. The bungalow has no steps if you enter the house through the internal access garage. There is a large walk in bathroom which is also wheel chair accesible. Der Gastgeber hatte die Buchungsdaten verwechselt und uns erst einen Tag später erwartet. Der Checkin konnte daher erst nach einigen Stunden Verzögerung erfolgen, da das Haus erst noch gereinigt werden musste. Hierbei wurden sicher wegen der Eile einige Stellen recht Oberflächlich behandelt. Das Haus ist sehr groß, modern und sehr gut ausgestattet. Großer überdachter Partio mit allem Komfort. Preis und Leistung sind hier mehr als angebracht. Wir würden es jederzeit wieder buchen. The home was a 5 star retreat for sure. Wonderful big home with heaps of hang out areas making the trip really relaxing and comfortable. Wonderful big home with heaps of hang out areas making the trip really relaxing and comfortable. Great location and close to everything you need. Will definitely stay again. Top spot and a very well appointed property. This is a cosy property with comfy beds in an safe location. This is a cosy property with comfy beds in an safe location. On top of that, it was close to several facilities of interest to us as tourists and we couldn't have asked for more as our holiday was a memorable one. The location is fantastic! So so close to the lake which was great for evening walks and down a nice and quiet street away from cars and traffic. The property was mostly tidy and and well presented. We did find some dirty cups in the drawers as well as dirty cutlery. The single beds sheets were not clean but there was plenty of linen so we changed them. The other two beds were well presented with crisp white sheets. The outdoor space is great for hot summer days and evening relaxing.